For this week's Mammal Monday, let's check out the pangolin! This endangered species (photo from www.savepangolins.org) is a small (species range from 3 1/2 to 70 lbs), scaly mammal found in southeast Asia and parts of Africa. Also known as scaly anteaters, pangolins use their thick, strong claws and incredible sense of smell to find their primary food of ants and termites. They are nocturnal and secretive. The eight species of pangolins live in many different habitats including forests, thick brush, grasslands, and even cultivated areas. All eight species of pangolin are protected under national and international law, and two of the species are listed as endangered on the IUCN Red List of Threatened Species. It’s unclear how long pangolins live in the wild, but they’ve been known to live up to 20 years in captivity. The major threats to pangolins are habitat loss and illegal hunting for their meat and scales (used in Asian medicine). Meat-free Friday -- something's fishy! It's springtime! The cherry blossoms are blooming and the shad are starting to run up the Potomac. So although it’s meat-free Friday, I know many greenmomsters like to cook fish on Friday (and today's Good Friday....), so today’s post is a little different. Thanks to a world population of 7 billion people and industrial fishing methods, many of the world’s fisheries are severely depleted (and under-regulated fish farming can lead to severe pollution). So what’s a greenmomster with a hankering for fish supposed to do? The Monterey Bay Aquarium has an app for that! Here’s the link for a cool app that tells you which fish populations are currently severely depleted and which populations are currently relatively healthy. You can head to the grocery store or fish market armed with your phone and make environmentally-friendly decisions as you choose tonight’s dinner. Of course, greenmomster always encourages you to eat as low on the food chain as possible, but we know that once in a while you just feel like some fish! It's almost spring, but we still like stew around here! I adapted this recipe from one I found many moons ago on the back of a can of Furmano’s Italian Style Diced Tomatoes. Nice and hearty for a late winter Friday. In our occasional series, Celebrities Doing Green Stuff, we take a look at the environmental causes and activities that celebrities have decided to champion. Today's celebrity is Matt Damon. His cause -- water! Water management is a growing concern throughout the world, from drought-stricken California to water-poor Yemen and polluted water in Brazil. Water is a resource that, when polluted or simply missing, causes widespread suffering and environmental refugees. Did you know that over 600 million people in India alone (that's double the U.S. population) don't have access to a toilet? Did you know that the mosquitoes that carry the Zika virus breed in polluted areas and fly during the day (very different from malaria mosquitoes)? Did you know that the nation of Yemen doesn't have any rivers, so they take all of their water from groundwater -- a source that can be quickly depleted? Take a look at what Matt Damon is doing and how you can help. Koalas and possums are both marsupials (photo from worldsmostamazingthings.com)! 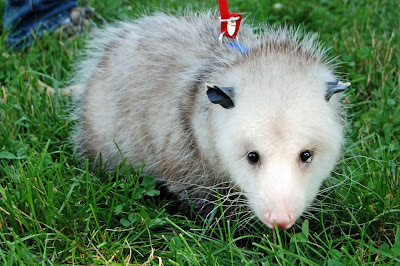 Virginia opossums are the only marsupials in North America, and koalas are only found in Australia. Breeding season for Virginia opossums has begun and they'll have 2 to 3 litters with a total of up to 12 or 13 offspring! Opossums play an important role in the ecosystem; they're omnivores and are prey for many larger species. How can you help protect opossums, other than getting your brakes checked? Don't litter! Many animals are attracted to road-side trash and they're then killed by cars as they look for a meal. Also remember that although opossums are great climbers, they like to build nests in hollow trees, logs, and rock piles -- so be sure to leave these areas in your yard! Who doesn’t love koalas, the tree-climbing spokes-mammal of Quantas Airlines? Adult koalas eat eucalyptus leaves and have a specially evolved intestinal system to be able to harmlessly digest these leaves and the toxins found in them. Koala size is a perfect example of an ecological rule called Bergmann’s rule (individuals of a species are bigger in populations that live in cooler climates, usually closer to the poles); southern koalas weigh between 20 and 30 pounds, while northern koalas weigh closer to 15 pounds. Meat-free Friday -- All things asparagus! My favorite way to prepare asparagus is very simple. First I wash the asparagus, use a potato peeler to peel the stems a little, and snap off the hard ends. I then place the asparagus on a baking sheet, spray with olive oil, sprinkle with salt, and broil at about 450 degrees for about 15 minutes – delicious!